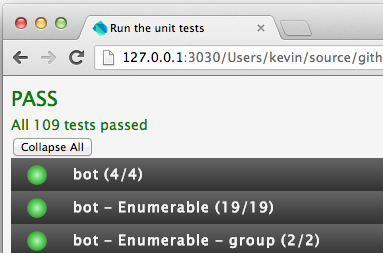 When writing any software, even for the web, I try to do as much testing as possible outside the browser. A lot of great testing can be done of algorithms, data models, and business logic without booting up Chrome. But some things you must test in a browser. The Dart Bag of Tricks (BOT) has had browser tests since the beginning. There are only a few tests that must be run in the browser, but I make sure to run all tests both on the console and in the browser if they can run both places. Browser tests are great, but they don't fit well into a build workflow or a continuous integration tool. For that you need a way to run and control a browser (or a browser-like thing) via the console and get results out. Enter DumpRenderTree. DumpRenderTree (DRT) is a great little tool hidden in the guts of WebKit. By default, DRT prints out an obscure text format representing the hierarchy of elements on the provided page. And since everything is keyed off the existence of window.testRunner, none of this affects the behavior of tests running normally in a browser. DRT is part of Linux and Windows builds of the Dart Editor now (look in the chromium) directory. It will be part of builds for Mac soon. If you want to get DRT that is compatible with the latest integration build of Dart - 0.3.2.0 (r17657) - grab this guy. Just make sure the DumpRenderTree executable is on your path when running tests. drone.io supports DumpRenderTree for Dart projects. Read about it here. The trick is creating a script that returns an exit code of zero for success and not zero (1 is pretty standard) for failure. Check out the script I created for BOT.